The roundtable discussion in Budapest gathered a group of international media professionals, lawyers and regulators from Hungary, Germany and Austria. This allowed a comparison of journalism practices in these countries. Speakers included János Horvát (Center for Independent Journalism Budapest), Manfred Protze (German Press Council), Simon INOU (Diversity Mediawatch Austria), Canan Topçu (journalist, university teacher, Germany), András Koltay (Media Council, Hungary), Bence György (TV2 channel, Hungary) and a number of other journalists, NGO representatives. Balazs Jó of the National Media and Infocommunications Authority made a presentation on the recent monitoring study of diversity in Hungarian news media. Mária Baranyi discussed her experiences as a reporter of Roma origin at the Hungarian Radio and the way she reports on social issues, Gabor Gyulai described Hungarian Helsinki Committee’s guide for journalists covering migration; and Gergely Szilvay analyzed the Hungarian media’s portrayal of topics related to the Catholic church. There were discussions about complaints procedures in media. 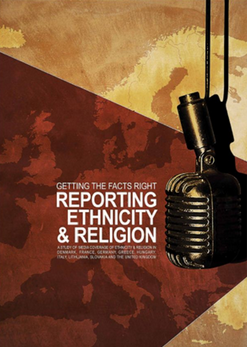 Ilona Moricz of the Center for Independent Journalism introduced the study “Reporting ethnicity and religion” by Ethical Journalism Initiative and the Hungarian translation of its recommendations at the event. Balazs Weyer, president of the self-regulatory Hungarian Editors’ Forum said: “We (the Forum) thought that general rules of accurate and fair reporting should be a sufficient guide to ethical reporting on these topics”. He added the forum may need to consider issuing specific, detailed recommendations on reporting ethnic topics.